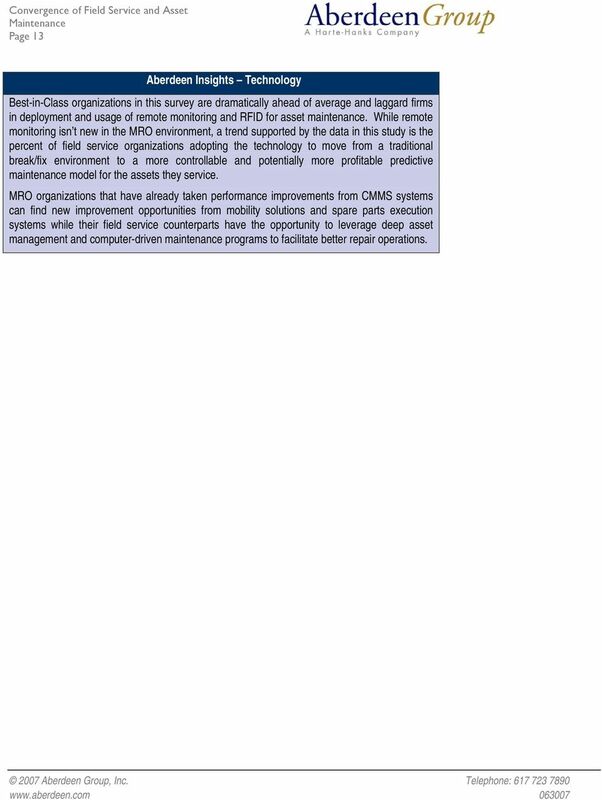 Download "The Convergence of Field Service and Asset Maintenance Bridging the Gap"
2 Page 2 Executive Summary A berdeen s research shows that 72% of field service organizations and 67% of and Repair (MRO) functions view demand for higher asset uptime and availability as the most significant pressure driving the need for process improvement in their organizations. 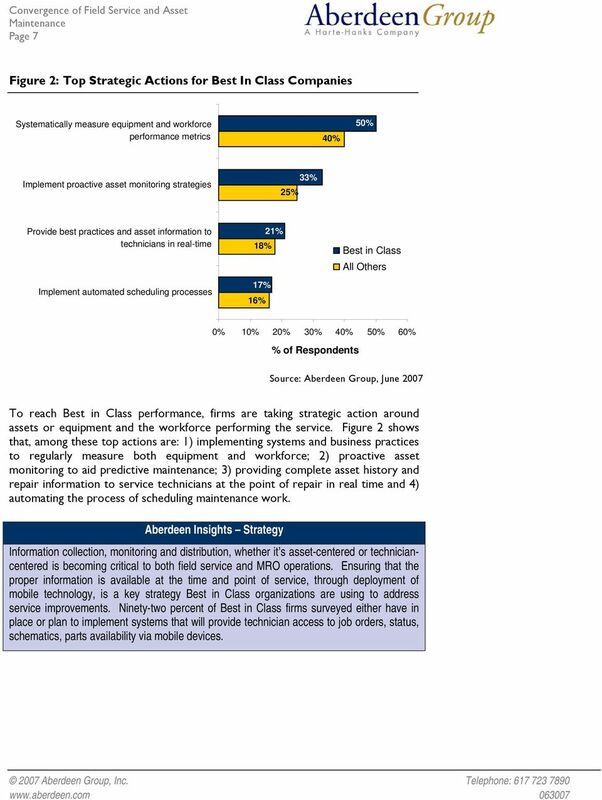 Best in Class organizations are leveraging best practices like systematically measuring equipment and worker-related performance to post substantially better Mean Time to Repair performance The findings are drawn from a survey of over 175 field service and MRO professionals. 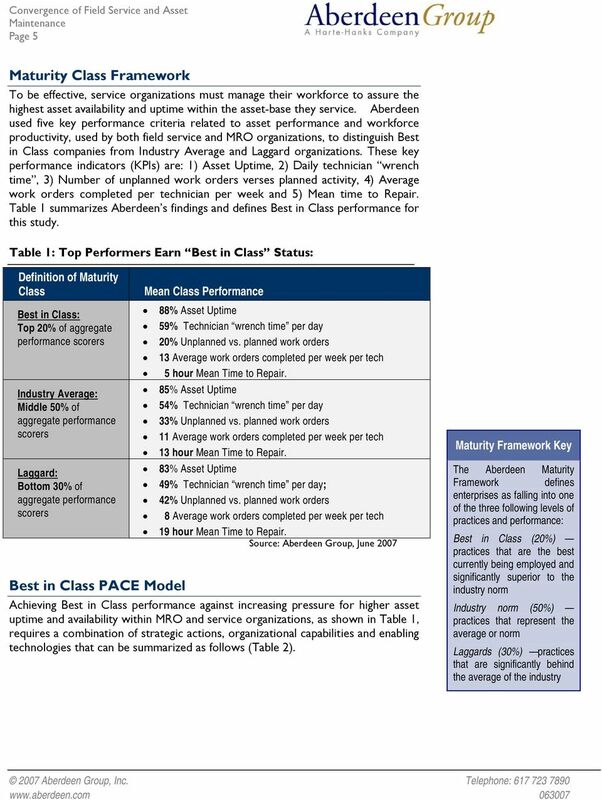 Best in Class Performance Aberdeen used five key performance criteria to distinguish Best in Class companies from all other organizations. These key performance indicators (KPIs) are the operational metrics most frequently cited as indicators of balanced service improvement performance. Over the last two years, Best in Class firms reported: 8% increase in overall asset uptime 50% higher than all others; 10% improvement in mean time to repair, the time from first notice of asset failure to completed repair twice the industry average; 10% improvement in technician wrench time almost three times that of all others. 13% increase in completed work orders per week twice that of others. 10% decrease in unplanned service incidents 30% higher than all others. Optimization of preventative and predictive maintenance activities, to make sure we re performing the right maintenance at the right time in the most cost effective way we can, is our key challenge in increasing reliability MRO Manager Large Chemical Manufacturer Competitive Maturity Assessment Survey results show that Best in Class organizations share several common characteristics: Leading organizations are nearly twice as likely as all others to have standard procedures for planning, forecasting and resource execution; Best in Class organizations are twice as likely as laggard companies to be using business intelligence and analytics; Best in Class organizations are six times as likely as the industry average to be using RFID to track and maintain assets. 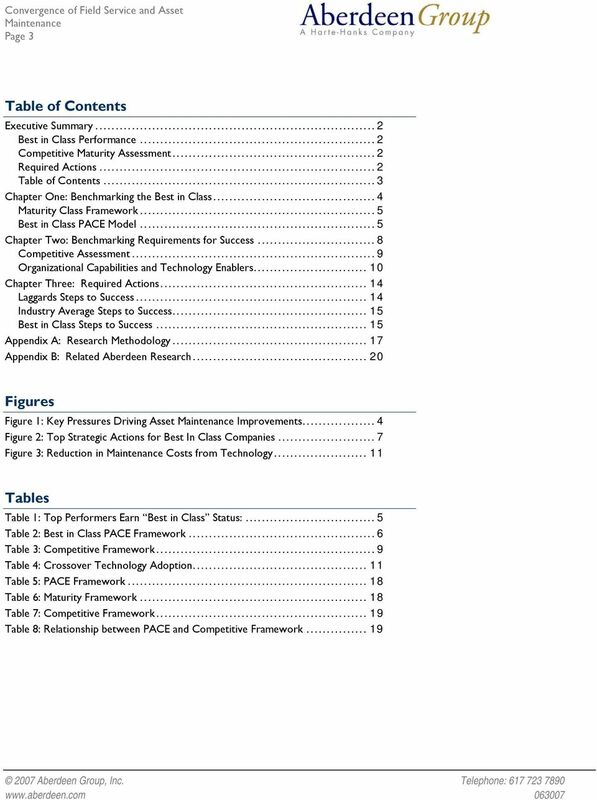 Required Actions In addition to the specific recommendations in chapter three of this report, to achieve Best in Class performance, organizations must: Integrate service support systems to facilitate better data flow and decision support; Accelerate evaluation of remote asset monitoring systems; Ensure robust asset history information is collected and maintained to better manage maintenance/service as well as asset lifecycle cost. 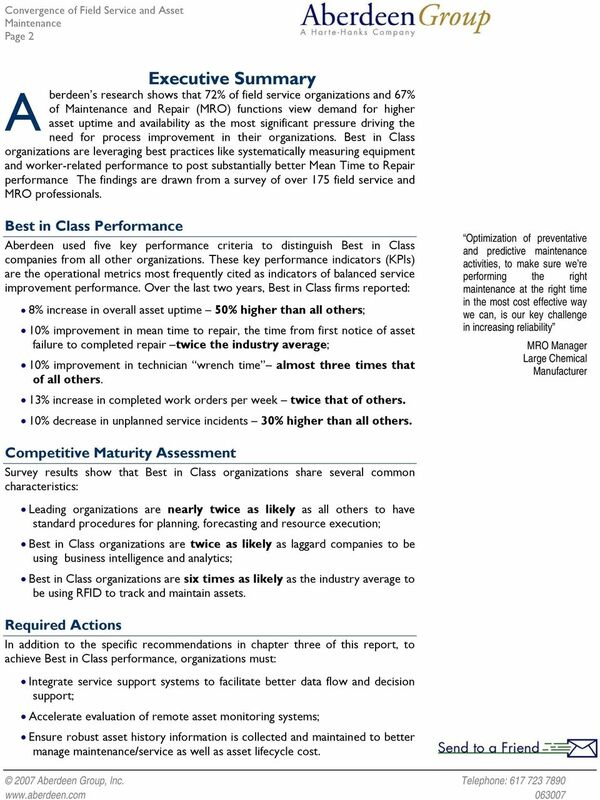 7 Page 7 Figure 2: Top Strategic Actions for Best In Class Companies Systematically measure equipment and workforce performance metrics 40% 50% Implement proactive asset monitoring strategies 25% 33% Provide best practices and asset information to technicians in real-time Implement automated scheduling processes 21% 18% 17% 16% Best in Class All Others 0% 10% 20% 30% 40% 50% 60% % of Respondents To reach Best in Class performance, firms are taking strategic action around assets or equipment and the workforce performing the service. Figure 2 shows that, among these top actions are: 1) implementing systems and business practices to regularly measure both equipment and workforce; 2) proactive asset monitoring to aid predictive maintenance; 3) providing complete asset history and repair information to service technicians at the point of repair in real time and 4) automating the process of scheduling maintenance work. Aberdeen Insights Strategy Information collection, monitoring and distribution, whether it s asset-centered or techniciancentered is becoming critical to both field service and MRO operations. Ensuring that the proper information is available at the time and point of service, through deployment of mobile technology, is a key strategy Best in Class organizations are using to address service improvements. Ninety-two percent of Best in Class firms surveyed either have in place or plan to implement systems that will provide technician access to job orders, status, schematics, parts availability via mobile devices. 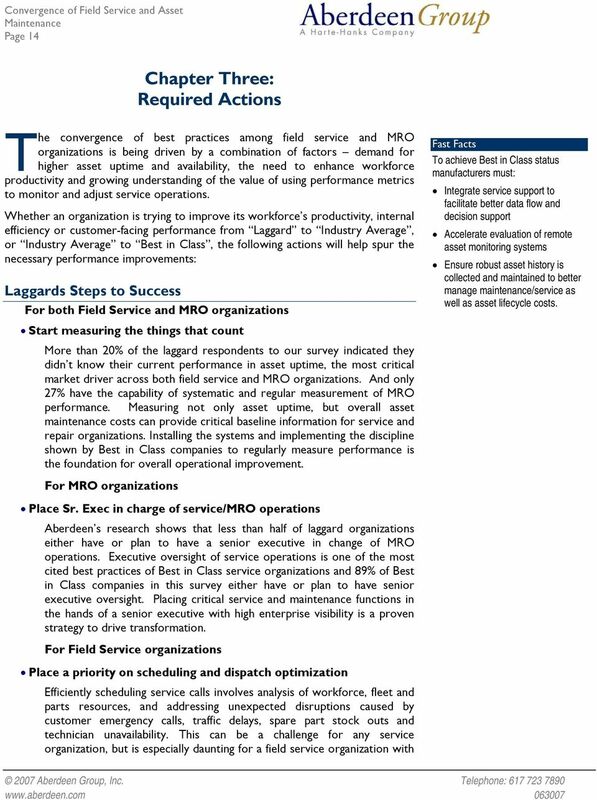 8 Page 8 Chapter Two: Benchmarking Requirements for Success Analytics, system integration, automation and mobile technology strategies yield significant benefit to MRO and service organizations when those strategies become part of an organization s core capabilities. Case Study: Tube Lines - Moving from Reactive to Proactive Tube Lines is charged with maintaining one of the world s oldest and largest mass transit railways the London Underground. Five years ago, when City officials outsourced maintenance to the public-private partnership, Tube Lines found itself struggling with outdated technology to support a mass transit system used daily by millions of passengers. 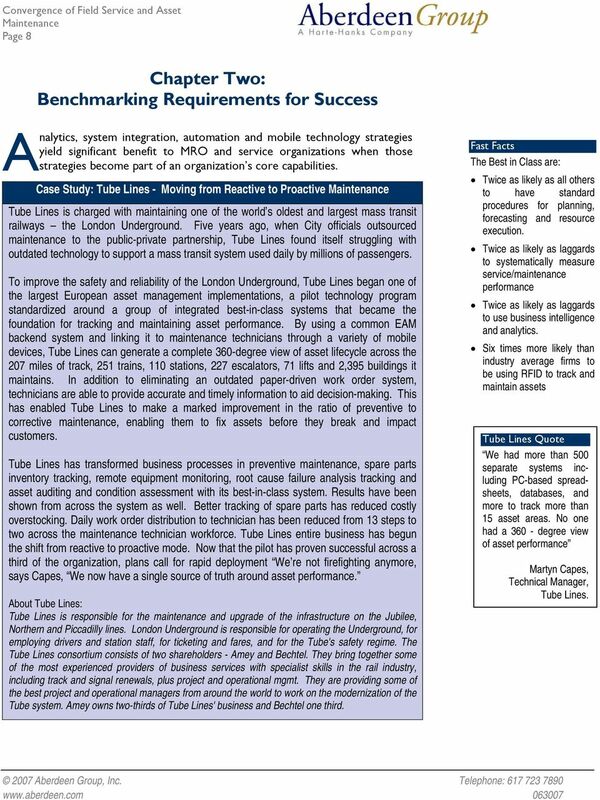 To improve the safety and reliability of the London Underground, Tube Lines began one of the largest European asset management implementations, a pilot technology program standardized around a group of integrated best-in-class systems that became the foundation for tracking and maintaining asset performance. By using a common EAM backend system and linking it to maintenance technicians through a variety of mobile devices, Tube Lines can generate a complete 360-degree view of asset lifecycle across the 207 miles of track, 251 trains, 110 stations, 227 escalators, 71 lifts and 2,395 buildings it maintains. In addition to eliminating an outdated paper-driven work order system, technicians are able to provide accurate and timely information to aid decision-making. This has enabled Tube Lines to make a marked improvement in the ratio of preventive to corrective maintenance, enabling them to fix assets before they break and impact customers. Tube Lines has transformed business processes in preventive maintenance, spare parts inventory tracking, remote equipment monitoring, root cause failure analysis tracking and asset auditing and condition assessment with its best-in-class system. Results have been shown from across the system as well. Better tracking of spare parts has reduced costly overstocking. Daily work order distribution to technician has been reduced from 13 steps to two across the maintenance technician workforce. Tube Lines entire business has begun the shift from reactive to proactive mode. Now that the pilot has proven successful across a third of the organization, plans call for rapid deployment We re not firefighting anymore, says Capes, We now have a single source of truth around asset performance. About Tube Lines: Tube Lines is responsible for the maintenance and upgrade of the infrastructure on the Jubilee, Northern and Piccadilly lines. London Underground is responsible for operating the Underground, for employing drivers and station staff, for ticketing and fares, and for the Tube's safety regime. The Tube Lines consortium consists of two shareholders - Amey and Bechtel. They bring together some of the most experienced providers of business services with specialist skills in the rail industry, including track and signal renewals, plus project and operational mgmt. They are providing some of the best project and operational managers from around the world to work on the modernization of the Tube system. Amey owns two-thirds of Tube Lines' business and Bechtel one third. Fast Facts The Best in Class are: Twice as likely as all others to have standard procedures for planning, forecasting and resource execution. Twice as likely as laggards to systematically measure service/maintenance performance Twice as likely as laggards to use business intelligence and analytics. Six times more likely than industry average firms to be using RFID to track and maintain assets Tube Lines Quote We had more than 500 separate systems including PC-based spreadsheets, databases, and more to track more than 15 asset areas. No one had a degree view of asset performance Martyn Capes, Technical Manager, Tube Lines. 12 Page 12 Case Study: Columbia Gas Transmission Using Mobile Technology to Drive Excellence Columbia Gas Transmission, an operating company of NiSource, Inc. operates one of North America s largest underground natural gas storage systems and moves more than 3 billion cubic feet of natural gas per day through a 12,750 mile pipeline network. They serve local gas distribution companies, energy marketers, electric power generating facilities and hundreds of industrial and commercial end users in about a dozen states. To eliminate inefficient paper-based maintenance systems, Columbia Gas Transmission implemented a mobile work management system that provides two-way data flow between the company s information system and field technicians. Designed to aid preventive maintenance and regulatory compliance actions, the system tracks all work orders, providing instant access to asset information as well as regulatory requirements around the work order. It allows Columbia Gas Transmission to maintain a complete work history to meet audit requirements and produce better, more accurate data around work activities. It also allows technicians in the field to generate work orders, monitor asset conditions in the field and capture remote asset performance data. While the end results are impressive, implementing such a comprehensive system requires effective planning and attention to a myriad of details. Michele Forsbrey, Sr. Work Management Consultant with Columbia Gas Transmission cites two: user acceptance and the selection of the right mobile devices to provide the final link in the system. For example, we knew we needed a ruggedized device for our 500 field users, she said. A consumer device just wouldn t stand up to the work we do. It had to be intrinsically safe given the environment around natural gas. And we needed a device that would have greater longevity with fewer model changes than typical consumer devices. Key Fact In the area of compliance alone, Columbia Gas has been able to reduce the time needed to prepare data for numerous required DOT audits from a week to a few hours, saving them labor weeks per year. Once the software and hardware decisions had been made and project implemented, Michele and her team had to deal with a common service transformation challenge - user acceptance. One of our biggest hurdles was the users themselves and their willingness to accept the new technology, Forsbrey says, They had been doing it on paper for so long that many of them were reluctant to change. The team was able to overcome the challenges by identifying technology champions in each service team that piloted the new technology. As others saw the productivity improvement the system offered, adoption accelerated. 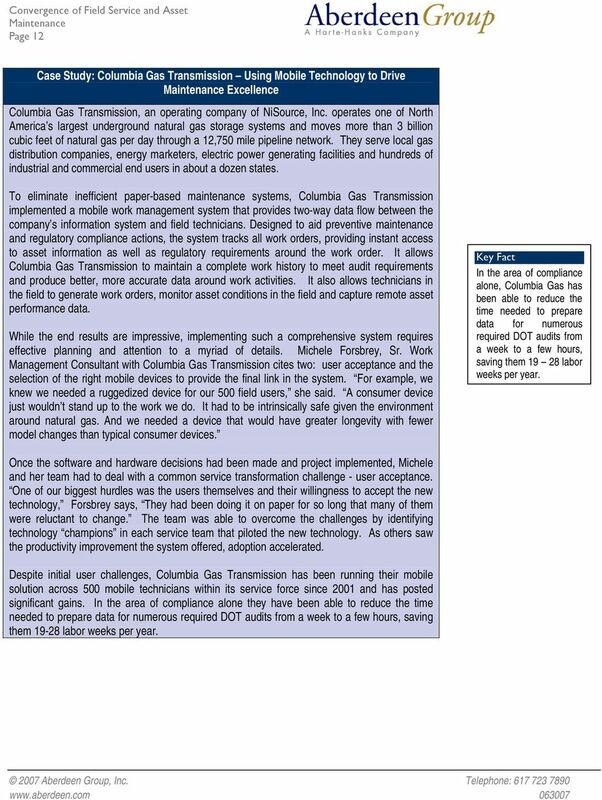 Despite initial user challenges, Columbia Gas Transmission has been running their mobile solution across 500 mobile technicians within its service force since 2001 and has posted significant gains. In the area of compliance alone they have been able to reduce the time needed to prepare data for numerous required DOT audits from a week to a few hours, saving them labor weeks per year. 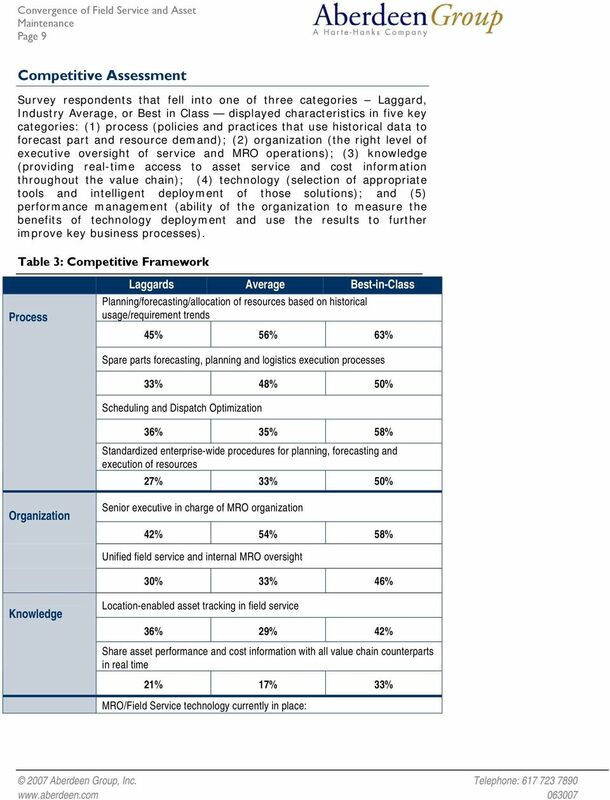 13 Page 13 Aberdeen Insights Technology Best-in-Class organizations in this survey are dramatically ahead of average and laggard firms in deployment and usage of remote monitoring and RFID for asset maintenance. 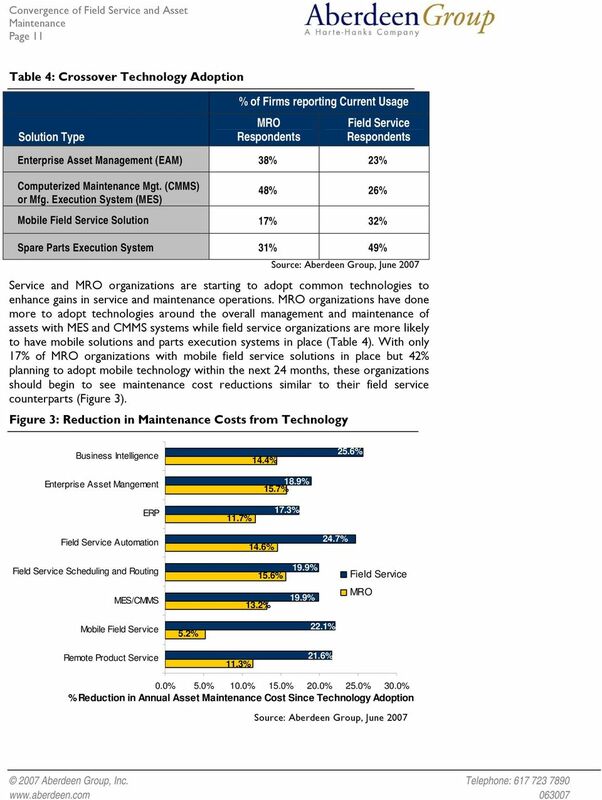 While remote monitoring isn t new in the MRO environment, a trend supported by the data in this study is the percent of field service organizations adopting the technology to move from a traditional break/fix environment to a more controllable and potentially more profitable predictive maintenance model for the assets they service. MRO organizations that have already taken performance improvements from CMMS systems can find new improvement opportunities from mobility solutions and spare parts execution systems while their field service counterparts have the opportunity to leverage deep asset management and computer-driven maintenance programs to facilitate better repair operations. 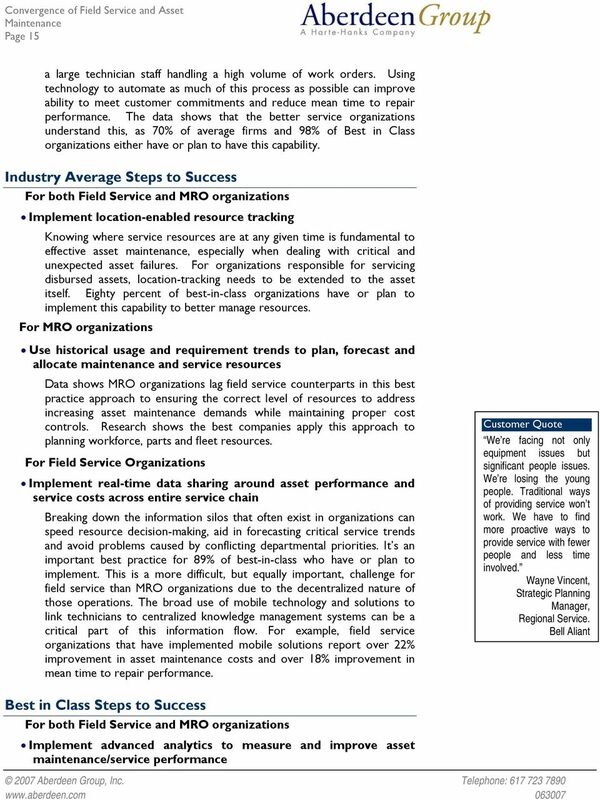 16 Page 16 Organizations across both Field Service and MRO organizations that have implemented business intelligence and analytic technology to measure service and maintenance operations are showing substantial improvements across all relevant performance measurement areas. Regular review of performance, coupled with systems that pinpoint exact variances between planned and actual activity, and that make information available to all relevant line executives can have significant impact on operations. 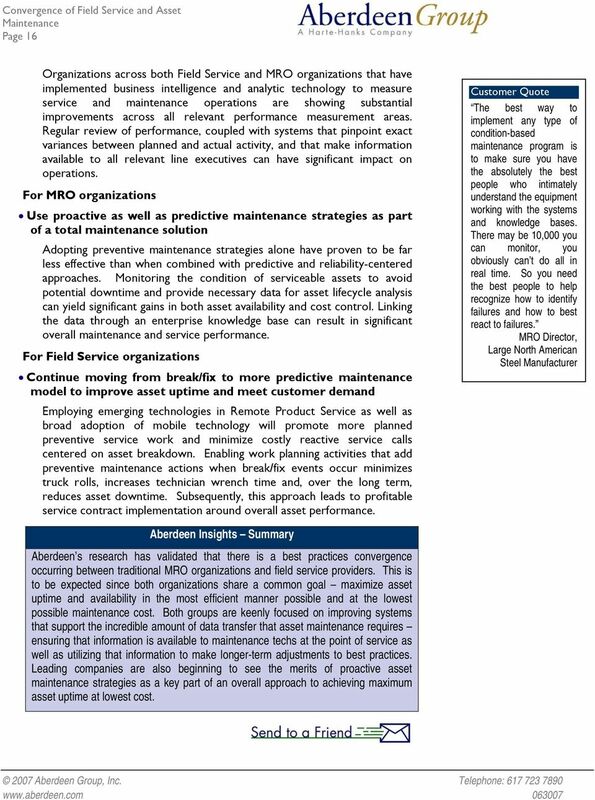 For MRO organizations Use proactive as well as predictive maintenance strategies as part of a total maintenance solution Adopting preventive maintenance strategies alone have proven to be far less effective than when combined with predictive and reliability-centered approaches. Monitoring the condition of serviceable assets to avoid potential downtime and provide necessary data for asset lifecycle analysis can yield significant gains in both asset availability and cost control. Linking the data through an enterprise knowledge base can result in significant overall maintenance and service performance. 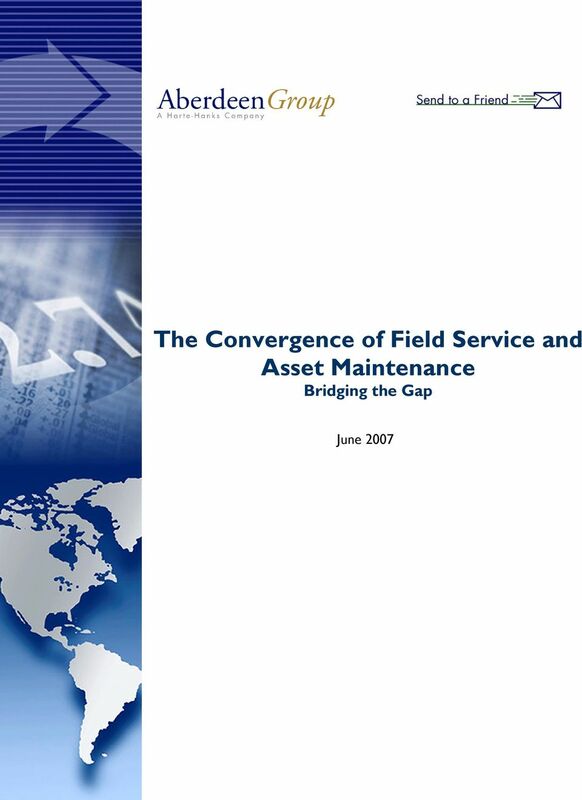 For Field Service organizations Continue moving from break/fix to more predictive maintenance model to improve asset uptime and meet customer demand Employing emerging technologies in Remote Product Service as well as broad adoption of mobile technology will promote more planned preventive service work and minimize costly reactive service calls centered on asset breakdown. Enabling work planning activities that add preventive maintenance actions when break/fix events occur minimizes truck rolls, increases technician wrench time and, over the long term, reduces asset downtime. Subsequently, this approach leads to profitable service contract implementation around overall asset performance. Customer Quote The best way to implement any type of condition-based maintenance program is to make sure you have the absolutely the best people who intimately understand the equipment working with the systems and knowledge bases. There may be 10,000 you can monitor, you obviously can t do all in real time. So you need the best people to help recognize how to identify failures and how to best react to failures. MRO Director, Large North American Steel Manufacturer Aberdeen Insights Summary Aberdeen s research has validated that there is a best practices convergence occurring between traditional MRO organizations and field service providers. This is to be expected since both organizations share a common goal maximize asset uptime and availability in the most efficient manner possible and at the lowest possible maintenance cost. Both groups are keenly focused on improving systems that support the incredible amount of data transfer that asset maintenance requires ensuring that information is available to maintenance techs at the point of service as well as utilizing that information to make longer-term adjustments to best practices. Leading companies are also beginning to see the merits of proactive asset maintenance strategies as a key part of an overall approach to achieving maximum asset uptime at lowest cost. 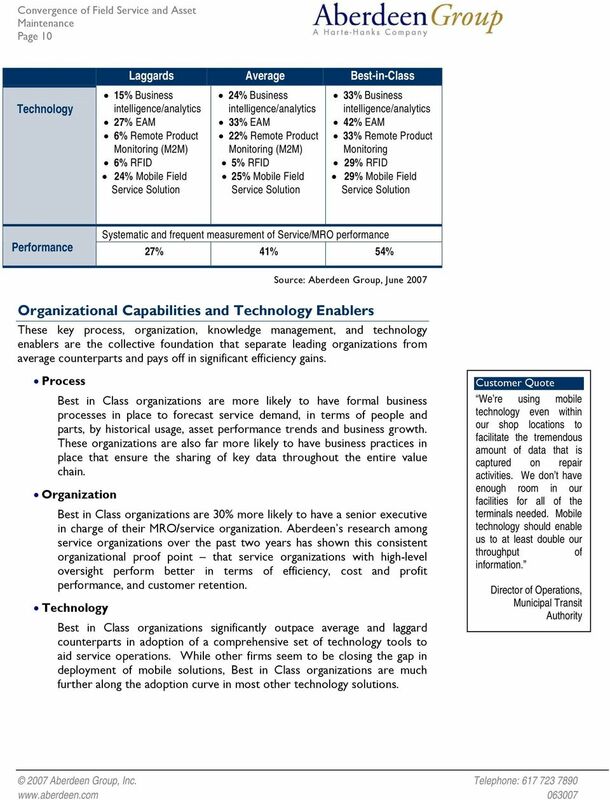 17 Page 17 Appendix A: Research Methodology In May and June of 2007, Aberdeen Group examined the asset maintenance/service strategies, capabilities, and related technologies of over 175 companies. 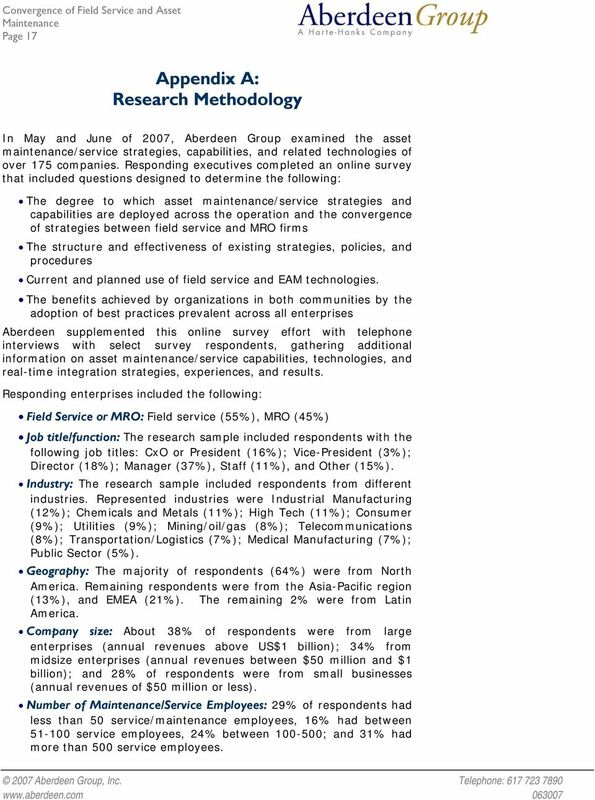 Responding executives completed an online survey that included questions designed to determine the following: The degree to which asset maintenance/service strategies and capabilities are deployed across the operation and the convergence of strategies between field service and MRO firms The structure and effectiveness of existing strategies, policies, and procedures Current and planned use of field service and EAM technologies. The benefits achieved by organizations in both communities by the adoption of best practices prevalent across all enterprises Aberdeen supplemented this online survey effort with telephone interviews with select survey respondents, gathering additional information on asset maintenance/service capabilities, technologies, and real-time integration strategies, experiences, and results. Responding enterprises included the following: Field Service or MRO: Field service (55%), MRO (45%) Job title/function: The research sample included respondents with the following job titles: CxO or President (16%); Vice-President (3%); Director (18%); Manager (37%), Staff (11%), and Other (15%). 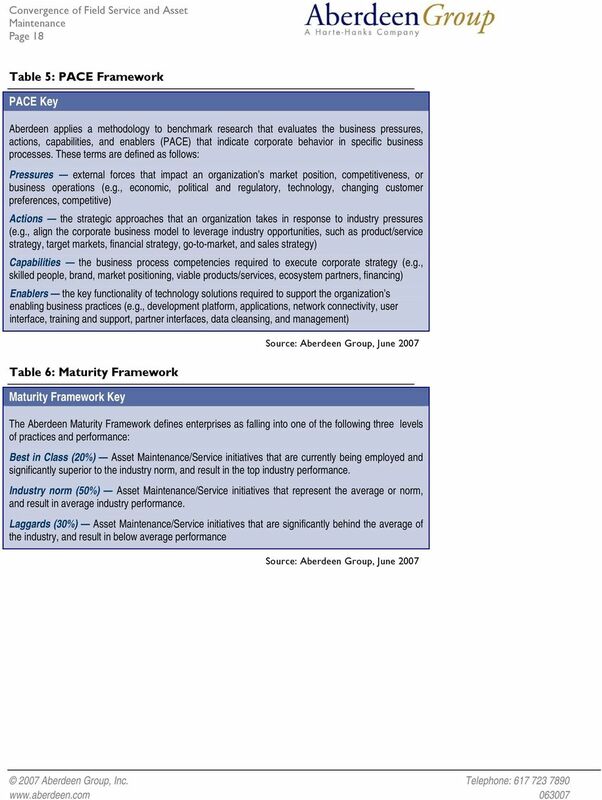 Industry: The research sample included respondents from different industries. Represented industries were Industrial Manufacturing (12%); Chemicals and Metals (11%); High Tech (11%); Consumer (9%); Utilities (9%); Mining/oil/gas (8%); Telecommunications (8%); Transportation/Logistics (7%); Medical Manufacturing (7%); Public Sector (5%). Geography: The majority of respondents (64%) were from North America. Remaining respondents were from the Asia-Pacific region (13%), and EMEA (21%). The remaining 2% were from Latin America. Company size: About 38% of respondents were from large enterprises (annual revenues above US$1 billion); 34% from midsize enterprises (annual revenues between $50 million and $1 billion); and 28% of respondents were from small businesses (annual revenues of $50 million or less). Number of /Service Employees: 29% of respondents had less than 50 service/maintenance employees, 16% had between service employees, 24% between ; and 31% had more than 500 service employees. 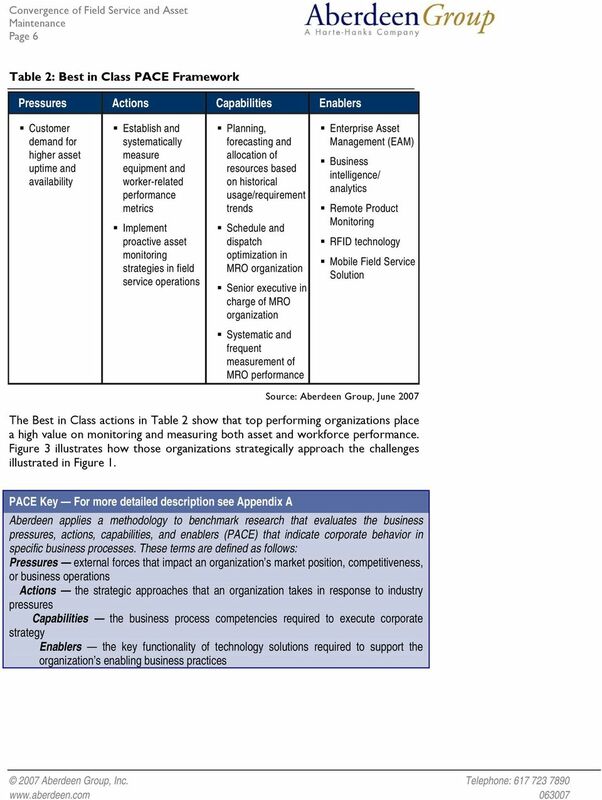 19 Page 19 Table 7: Competitive Framework Competitive Framework Key Process What is the scope of process standardization? What is the efficiency and effectiveness of this process? Organization How is your company currently organized to manage and optimize this particular process? Knowledge What visibility do you have into key data and intelligence required to manage this process? Technology What level of automation have you used to support this process? How is this automation integrated and aligned? Performance What do you measure? How frequently? What s your actual performance? 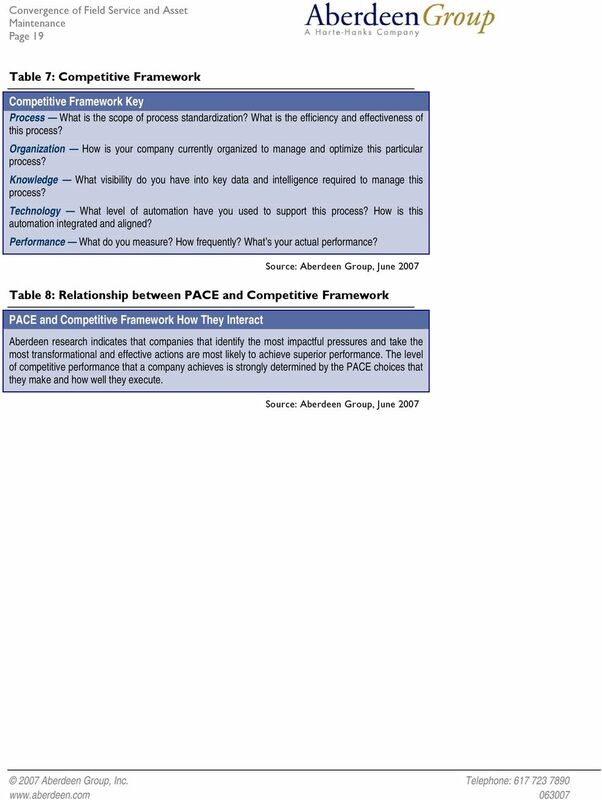 Table 8: Relationship between PACE and Competitive Framework PACE and Competitive Framework How They Interact Aberdeen research indicates that companies that identify the most impactful pressures and take the most transformational and effective actions are most likely to achieve superior performance. The level of competitive performance that a company achieves is strongly determined by the PACE choices that they make and how well they execute. 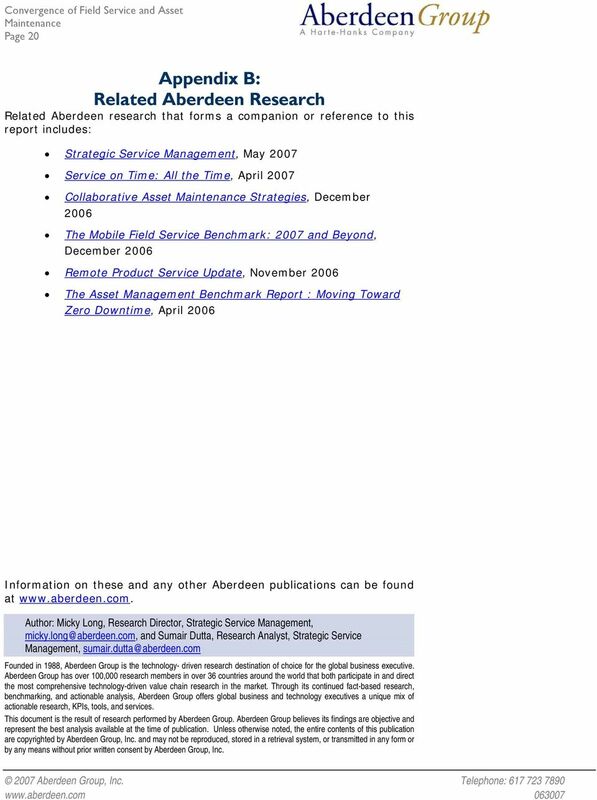 20 Page 20 Appendix B: Related Aberdeen Research Related Aberdeen research that forms a companion or reference to this report includes: Strategic Service Management, May 2007 Service on Time: All the Time, April 2007 Collaborative Asset Strategies, December 2006 The Mobile Field Service Benchmark: 2007 and Beyond, December 2006 Remote Product Service Update, November 2006 The Asset Management Benchmark Report : Moving Toward Zero Downtime, April 2006 Information on these and any other Aberdeen publications can be found at Author: Micky Long, Research Director, Strategic Service Management, and Sumair Dutta, Research Analyst, Strategic Service Management, Founded in 1988, Aberdeen Group is the technology- driven research destination of choice for the global business executive. Aberdeen Group has over 100,000 research members in over 36 countries around the world that both participate in and direct the most comprehensive technology-driven value chain research in the market. Through its continued fact-based research, benchmarking, and actionable analysis, Aberdeen Group offers global business and technology executives a unique mix of actionable research, KPIs, tools, and services. This document is the result of research performed by Aberdeen Group. Aberdeen Group believes its findings are objective and represent the best analysis available at the time of publication. Unless otherwise noted, the entire contents of this publication are copyrighted by Aberdeen Group, Inc. and may not be reproduced, stored in a retrieval system, or transmitted in any form or by any means without prior written consent by Aberdeen Group, Inc.
INTERNET OF THINGS: SCIENCE FICTION OR BUSINESS FACT? Infor EAM How to fix your maintenance program In today s highly competitive landscape, it s no longer enough to simply track and fix your equipment assets. Your maintenance program needs to go deeper.